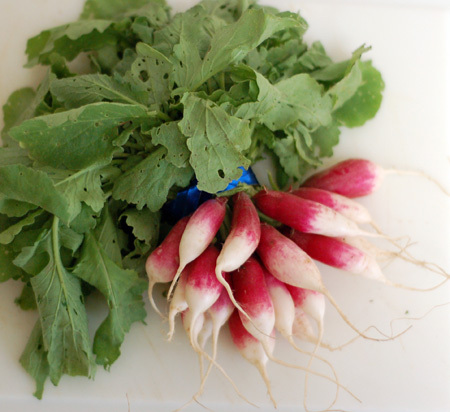 One of my finds at the farmer’s market last weekend was a bunch of organic French breakfast radishes from Minto Island Growers. I used to like eating raw radishes with salt as a child, but hadn’t tasted one in years, despite being drawn to their jewel-like appearance almost every spring. These slim radishes with their sprightly greens caught my eye, though, and this time I didn’t try to resist them. When I got home from the market, I separated, washed, and stored the greens (just as I did with the turnip greens two weeks ago, but with less consternation regarding the texture—turnip greens are prickly!). I’m trying to make a point of having a taste of all my vegetables raw these days, no matter how small a taste it may be, and offering them in that state to my toddler as well (he seems to enjoy raw onion, broccoli, and potato, although the latter was not my idea—he dug into a bag of red potatoes and started snacking on them like apples—and I put a stop to it). So I first sampled a raw radish with a smear of soft butter and fleur de sel after the French example: this variety is very mild, with that characteristic pepperiness coming in just at the finish. I decided to save some of my radishes for braising with butter and grate the rest into a loaf of focaccia flatbread, accompanied with a soup made with the radish greens. 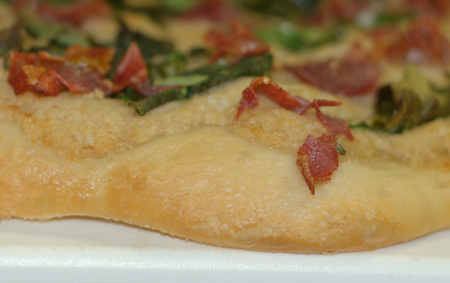 For good measure and a bit of protein, I also made a flatbread flavored with white bean dip, Parmesan, prosciutto and arugula. The white bean focaccia was very like a flatbread pizza, despite the fact that we were out of every sort of cheese except Parmesan and Pecorino romano. I baked this one at 400F for about 10 minutes with just a drizzle of olive oil on top, then spread it with a dip made of pureed white beans, a splash of leftover white bean Caesar dressing with additional salt, garlic, red wine vinegar and Dijon, and a few tablespoons of mascarpone cream, all thinned to a spreadable consistency with olive oil. Over the dip went liberally grated Parmesan, slices of prosciutto, and a handful of torn arugula; then it went back in the oven for 10-15 minutes, until the prosciutto was crisp. 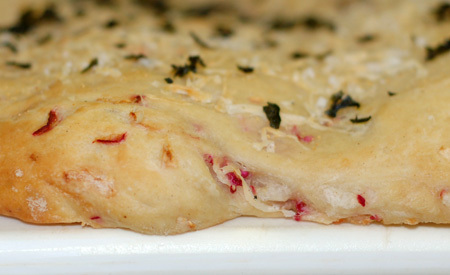 As for the radish focaccia, I coarsely grated about half a cup’s worth of my pretty little radishes (the shreds kept reminding me of fingernail clippings with red nail polish, unfortunately) and kneaded them into a lump of dough. Next time I might salt and drain the radish shavings first, as they added enough moisture to make the dough quite sticky as I flattened it out. This flatbread was topped with fleur de sel, fresh ground pepper and a drizzle of olive oil, and parbaked in the same way as the previous one. At the halfway mark, I generously grated Pecorino romano cheese over top, and put it back in to brown up. When it was done, I crushed up a few leftover baked kale chips and sprinkled the bits over top for color. The radish flavor was almost too subtle to taste, and might stand up better with a sharper variety. In between the baking, I also made a very simple soup with onion, potato, a few garlic scapes, and those radish greens. 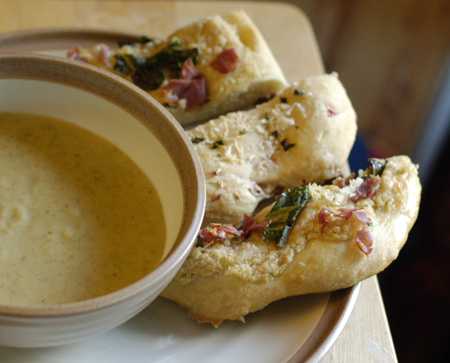 My potato was huge and the bunch of radish greens comparatively small, so my soup didn’t turn out as green as some of the other examples out there, but it was silky smooth and had a delicious subtle flavor that worked well with the flatbreads. Jeremy scraped his bowl clean, a noteworthy event considering his general dislike for many soups. This post is linked up with Foodie Friday, Fight Back Friday, Food on Fridays, and Wholesome Whole Foods. Saute onion and garlic scapes in oil and butter until onion is translucent; add potato and saute for several minutes more. Add radish greens, 3 C stock and lemon juice; simmer until vegetables are very tender. 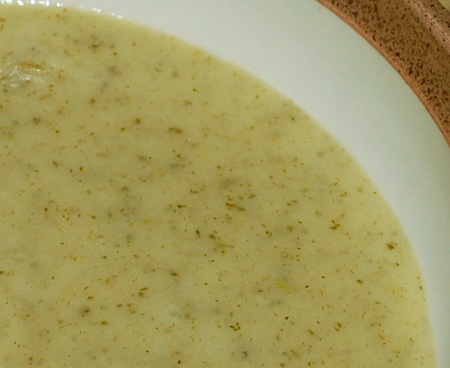 Add mascarpone cheese and a few big pinches of salt, and puree everything with a stick blender (or normal blender) until very smooth; add a bit more chicken stock or water if the soup is more scoopable than spoonable. Adjust seasonings and serve. I loved how you used the radish in so many different ways. The soup sounds delish! Oh, this all looks so delicious! 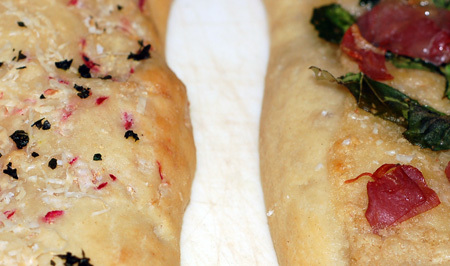 I would love to try your soup, and I never thought to grate radishes into the foccacia dough. Great photos, too. Thank you for sharing. Christy, the soup was very good, but I think it would have been improved by a closer ratio of potato to greens. Next time, right? Billie, thanks for stopping by! Let me know what you think if you try the soup.